Yarn pom poms are a charming little addition to knitted hats and scarves. They're fun on their own too, just stick some googly eyes or felt ears on them, and you have a new creature. They are a great use of scarp yarn, and kids can make them with almost no adult assistance. Step 1: Cut out a template (download the printable pom pom template here) and trace it twice on to your cardboard. With the craft scissors, cut out your traced shapes. Step 2: Sandwich the two cardboard donuts together. Leave a long tail and put it between the cardboard layers. Then, starting about 1/4 inch from the slit in the cardboard, wrap the yarn around the ring of the donut, using the slit to feed the yarn in. Keep wrapping until the donut is really full of yarn. The fuller the better. Step 3: Break your yarn, leaving a long tail. Hold on to your sandwich firmly at the center of the donut. 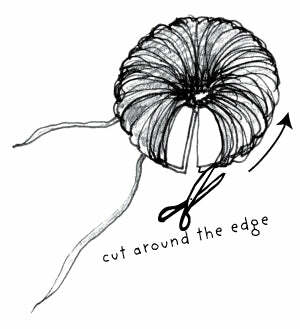 With the tips of your scissors, cut through all the layers of yarn around the edge of the donut. Step 4: Take the two tails of yarn and wrap them 2 or 3 times around the center between the two layers of cardboard. Pull them tight and tie a knot. Carefully slide out your cardboard donuts (you can use them again for another pom pom).